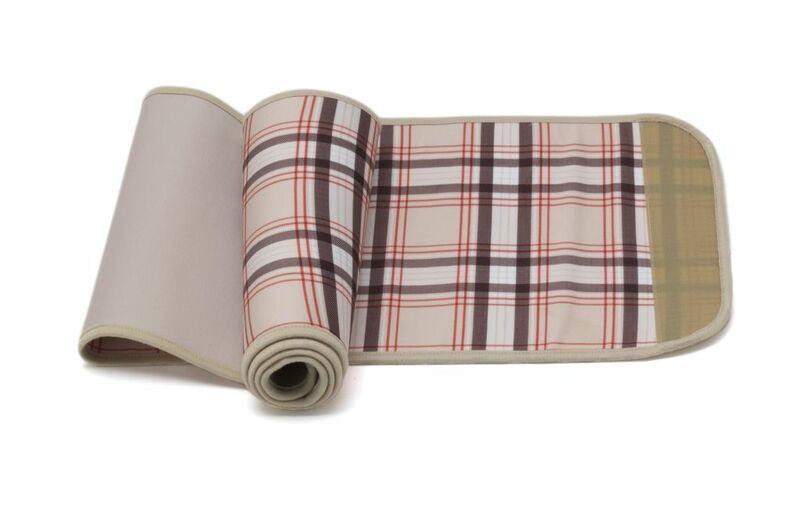 Our deluxe Couture Belly Bandit® is fully covered with an extremely silky soft fabric. A solid outer cover with an inside peek-a-boo print that’s simply fabulous! Why not feel extra cute while losing that post-pregnancy belly? Engineered with a unique medical grade elastic our latex free powerful post pregnancy secret can be adjusted to fit around the belly, waist and hips to create the ultimate slimming result. A superior support system that delivers best in class results to every woman. The Couture Belly Bandit® is designed for the ultra chic mom with a tummy tightening ambition. Stylish, impressive, gratifying and all together smashing! In order to receive maximum belly, waist and hip shrinking benefits you should wear this for 6-8 weeks post delivery. Winner of the 2008 Disney iParenting Media Award "Best Mom Product"
Material: 92% polyester and 8% spandex, and the outer shell is 100% polyester. Feels similar to bathing suit material. If you are purchasing a Belly Bandit® early on in your pregnancy, your best bet is to go up 1 to 2 band sizes from your pre-pregnancy belly size. In the eighth month many women will be the same size as they will be post delivery. Simply measure the circumference of your abdomen starting at your belly button. Choose the corresponding band for your size. Just prior to delivery simply subtract 3 to 5 inches from your belly measurement. Select the corresponding band for that size. If you purchase your Belly Bandit® after you give birth, simply choose the corresponding band for belly size. The Belly Bandit® is designed with five inches of adjustability to stay tight as you shrink. The fit was so comfortable and the print was so stylish and fun! I just want to thank you for helping me shrink my post baby belly! I wouldn't believe it if I didn't see the results with my own eyes on my body. I will tell every pregnant mother that i see on the streets about this product! The fit was so comfortable and the print was so stylish and fun! And trust me nothing looks cute on a body that just had a baby. Thanks for all the cool prints and making it fun! Keep up the great work! Our little guy was born on Friday last week and all is well. I just had to write you to say thank you for the Belly Bandit. It was amazing because I started wearing it the day after the c section and I could barely velcro it around my still big belly and now, only 6 days later I can velcro it all the way to the other side. I'm thinking I might need to order a small one so I can continue my path back to a somewhat normal size. Anyway, I know I sound like an infomercial and you already know all this but I just wanted to thank you.